Anytime breastfeeding discrimination makes it in the headlines I always seem to hear the same few arguments. 1.) Brings awareness to the law that protects breastfeeding moms. Many people, including businesses are not familiar with the law. It’s sad we even need a law in the first place, but it was because of these incidences there needed to be something set in stone showing society that breastfeeding is here to stay whether or not you like it. Tell a mom to stop breastfeeding, go elsewhere, or cover herself they are infringing on her rights. 2.) 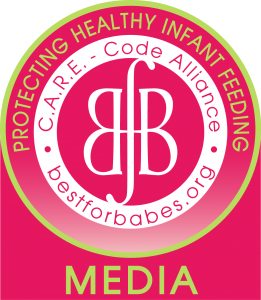 Informing people that breastfeeding discrimination is a serious thing and will not be tolerated. Many people do not understand how serious of an issue it is to even simply suggest to a mom that she should cover or go to a nursing room. That is a form of discrimination and just like it’s serious to discriminate based on age or race, the same applies to how a mother feeds her baby. People need to understand that it is discrimination and it goes way bigger than just their opinion. 3.) Other business owners & corporations can take notice and ensure the same thing doesn’t occur at their place of business. No business wants bad publicity so when other businesses take notice as to the bad publicity that could occur had it been one of their employees involved in breastfeeding discrimination , they can set up the training as to exactly what their employees are to do if a situation involving a breastfeeding mom were to come up. For instance, many people do not think anything is wrong for suggesting that a mom breastfeed in a bathroom and without realizing suggest that’s where a mom could go and that could cause a problem. Part of speaking out is showing society what is appropriate and what the common courtesy is for how a breastfeeding mom is treated because there is no rule book or guide. Employees need to be taught that if a customer complains to them about a mom breastfeeding they are to simply respond with, “She is well within her right to do so, my best advice is to move your location.” Realize they should not even involve the breastfeeding mom at all because she is not the problem and she does not need to be burdened with it. 4.) It empowers other breastfeeding moms not to put up with breastfeeding discrimination and that it is okay to fight back, if need be. Many moms think they are the one who should conform to what other people around them want to keep the peace and if they don’t they are disrespectful or the ones in the wrong. It’s simply not true. All breastfeeding moms should go into breastfeeding knowing that they are allowed to breastfeeding however they want and if the people around them do not like it , they do not need to concern themselves with it. 5.) Ensures that another breastfeeding mom won’t encounter the same treatment at the establishment. Most of the time it takes speaking out to get these businesses to understand how serious it is to mistreat a breastfeeding mom. A lot of the time she will ask for the manager and they seem to have no interest in helping to resolve the matter. I have seen places make some harsh statements about how they were not at fault and then after a few days of getting some education, they come back with a much different statement and in some cases a heartfelt apology. Now whether they honestly mean it , is irrelevant the fact is, they are letting the public know that they admit fault and that breastfeeding is welcome at their establishment in accordance to the law. When a mom speaks out about breastfeeding she is not overreacting, the people who make a big deal out of how she is breastfeeding are the ones overreacting. She is not just trying to get her “15 minutes of fame” , really ? How absurd is that? What exactly is she gaining from getting her time in the spotlight? Moms don’t wake up one day and think, “Hmmm I want everyone to notice me for being discriminated against.” that is absurd. I’ve just listed five productive reasons as to why speaking out against breastfeeding discrimination is needed, so keep them in mind the next time you see breastfeeding discrimination in the headlines and wonder what good is it accomplishing.